Keep track of everything you want to remember! 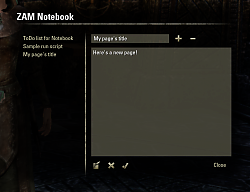 ZAM Notebook allows you to create as many pages as you wish to write down crafting materials you need to collect, save a script you would like to run, keep record of your RP back-story... whatever you need! the revamped version is located HERE, I'm going to start a new Addon post so that way if people want this version over the new one then they have a option. - the editbox is now scrollable if it has your cursor's focus! Yeah this would be nice....write a note log out and review that note on the other toon. Should be able too as long as you log on to the same windows account. So I have been trying to use this. I am guessing since it has not been updated since last year it is no longer useable? It's still useable, even without the update coming soon. I've never stopped using it throughout all the recent patches. Such a simple, but unbelievably handy add-on. I don't have to keep track of scraps of paper everywhere. shortly there will be an update, just need to tidy a few things up for the new revamped look of it. I guess the screen with Notebook open tells the whole story. It still works despite the buttons giving an error. From the comment here I believe that Seerah has already prepared working version for Update 5. If you do not want to wait, download file ZAM_Notebook-1.2.2a-for_Update5.zip from my dropbox folder (link in signature). Oops, yeah. Will get that up tomorrow night. Last edited by gillysan : 11/03/14 at 05:24 PM. This addon is great no more having to open notepad outside of game to write sh!t down. TYVM. I just have one request/suggestion. Would it be possible to add a scroll bar in the text box field? This would help a lot. Read right below your post. What you wrote stays up or down and you need to use page up/down or forward/backward keys to see other texts. Oh, I didnt know that too.